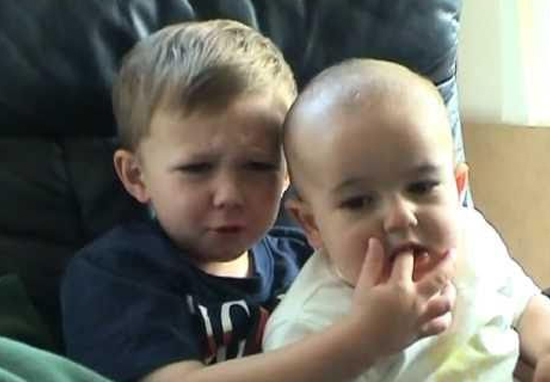 It has been ten years since Charlie bit Harry’s finger on camera and they became an internet sensation – and it’s making people feel really old. The iconic viral clip of two young brothers was filmed and uploaded by their dad at their home in Buckinghamshire, earning the family around £1 million and reaching almost 850 million hits on YouTube. The video shows Charlie sitting on Harry’s lap before Harry sticks his finger in his younger brother’s mouth (mistake). Charlie bites Harry’s finger and his reaction is both a little bit of sweet and a bit of funny thrown in for good measure. Harry is now a teenager at 13 years old – and Charlie is now 11. They live in the same house, with the same sofa that featured in the famous clip – and the boys’ dad still works full-time as an IT consultant. The original video was uploaded to YouTube back in 2007 and was never actually intended to go public. While their parents admit to making sure their sons always have “nice bicycles”, the majority of the money made from YouTube has been invested in private education for the boys. Charlie once came home and said, ‘Is it true you can buy me a Ferrari? It was only meant for family members… In 2007, sharing video files – about 50 megabytes – was hard. It was too big for email, so YouTube stood out as a great vehicle to share videos. After people had seen it, I didn’t see any point it being on there any longer. But when I went back to delete it, it was then I realised the video had a lot of views – almost doubling every day, so we decided to embrace it. And by October 2009 ‘Charlie Bit My Finger’ had become YouTube’s most watched video with 129 million hits, ousting the equally iconic ‘Evolution of Dance’. So yeah, let’s get to it – this is what the brothers look like now! Yeah, I know – I feel pretty old too.